ABD Engineering & Design is a nationally certified Women’s Business Enterprise as well as a Woman Owned Small Business. 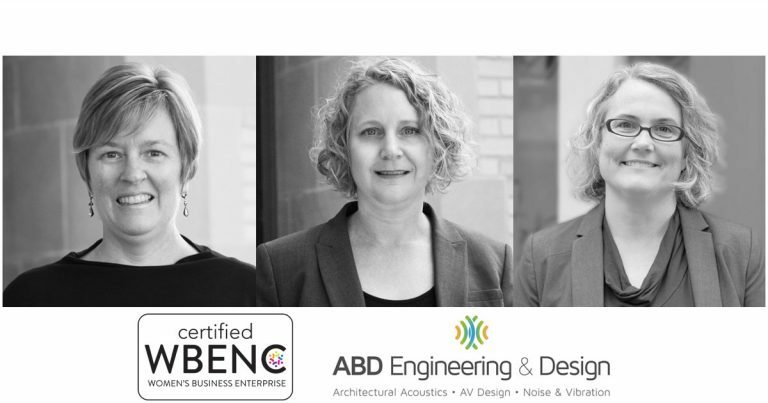 ABD is an independent acoustical engineering and audiovisual design firm with three women in our leadership team, one of which is the sole owner. We are honored to be among other women owned businesses, and proud to serve our clients with this certification. Our national certification comes through the Women’s Business Enterprise National Council (WBENC). WBENC’s national standard of certification, implemented by the Great Lakes Women’s Business Council, is a meticulous process including an in-depth review of the business, and an on-site inspection. The certification process is designed to confirm the business is at least 51% owned, operated, and controlled by a woman, or women. By including women-owned businesses among their providers, corporations and government agencies demonstrate their commitment to fostering diversity. Please keep us in mind for your projects that may benefit from this certification. What is a Certified Technology Specialist (CTS)?